Book Review: Sophie Duffy's "This Holey Life"
Home » books » cyprus well » review » Book Review: Sophie Duffy's "This Holey Life"
This is probably not the sort of book I would ordinarily pick up, but given that Sophie is this month's South West Writer Profile on the Cyprus Well website, I casually peeked at the review copy we were sent, and was drawn into the story. 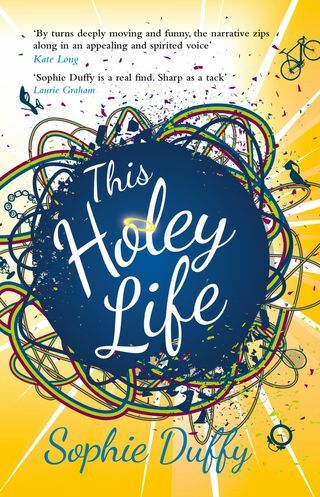 This Holey Life is the second novel by Teignmouth based writer Sophie Duffy. It tells the story of Vicky, a reluctant curate's wife, whose life is turned upside down when her brother is kicked out of his wife's house. Amidst the irritation of having her brother and his son stay in her already cramped home, Vicky is still trying to face the reality of the death of her baby boy. The novel is narrated by Vicky, a character who has been bottling up the grief of losing her child for some six years. As the story unfolds, Vicky's grief spills out, demonstrating the ongoing nature of her loss. The narrative style is casual, and Vicky has a very distinct and believable voice, that made me feel a real connection with her as a character. Duffy succeeds in writing a story which is both touching, and entertaining. I particularly enjoyed the relationship between Vicky and her brother Martin, who (to some extent) remain locked in the same sibling roles as when they were children. I liked the way the book explores the nature of family relationships, focusing as much on the bad as on the good. You can't choose your family, but Vicky comes to appreciate hers. This was an enjoyable read, and there are some great unseen plot twists along the way.